Bill Hodges Trilogy- a 2Sides review. 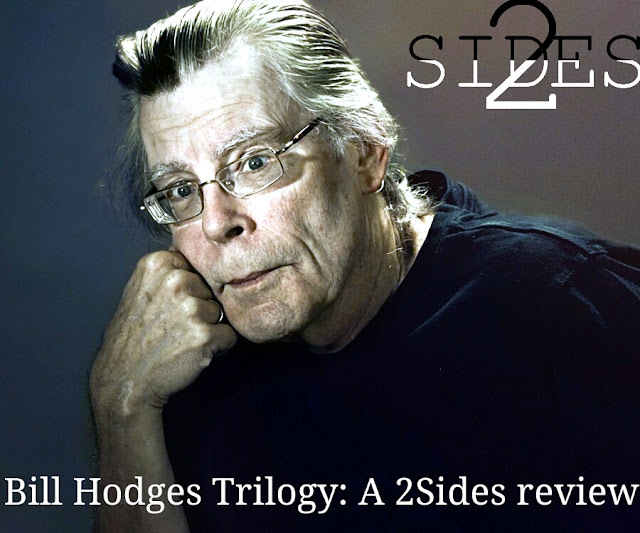 HomepranavPSBill Hodges Trilogy- a 2Sides review. Stephen King, the American author of wide renown, has always had horror as his go-to genre. What happens when he leaves the comfort of familiar territories? This trilogy is the result of his wading into the waters of detective fiction. It is business as usual for the prolific author, who manages to pump adrenaline into his readers with a generous sprinkle of devices of crime fiction. Time flies as pages turn in a great hurry. All the books in this trilogy begin with the scene at a job fair- the ground zero. How a single act of terrorism cripples the victims and their close ones forms the narrative. The protagonist, Detective Kermit William “Bill” Hodges (Ret. ), is an antithesis of your conventional hero. He is old, fat and has no command over any martial arts. While the amiable ex-cop doesn’t make fancy deductions a detective in the Sherlockian mould may make, he is presented as a decorated detective before the readers. He is miserable and contemplates suicide as we see him in the beginning. He toys with his father’s licensed revolver as he catches up on his quota of afternoon soaps. One fine day he receives a taunting letter from the antagonist, which provides him with the will to live and hunt him down, who had previously eluded him in the last case of his career. Brady Hartsfield is the merchant of horror in this trilogy. While he is not plotting to run random people down in a Mercedes or blowing up a rock concert, he works a couple of day jobs and closely observes his nemesis, the retired detective. By night he becomes a psycho with a flair for technology. Over the course of the three novels, he picks up a few sobriquets such as Mr. Mercedes and Suicide Prince, because of his questionable ideas of entertainment. Hodges is depressed like all the cops are, at the ends of their watch. This makes him a potential target for the “Suicide Prince”. But, as Hodges puts it, who is the fish and who is the fisherman in this relationship? The characters are a treat for the readers. They are described so intricately that after some pages into the book, they materialize before us. We effortlessly delve into their psyches. They remain with you long after you finish the trilogy. The underlying premise of the novels is obsession. Passion flows through the books, like an overflowing river during monsoon. A complicated love-hate relation between a recluse writer and his fan provides for the story in the second book, Finders Keepers. The situation holds a mirror up to us, the readers. To what extent will we, the readers, go for getting our hands on a favorite book? Some of the other prominent motifs running through the novels include poverty, racism, guilt, fandom and its extreme cousins.While gore is always a likely part of crime fiction, the many avatars of it may leave the reader unsettled. The best thing in the trilogy is the antagonist, who is written in many shades of grey and black. The character creeps you out every time he appears in the scene. The neurotic sidekick of the detective, Holly Gibney, is also a nuanced character. King's forte is designing authentic relationships and he has done a marvelous job in this work. While this may sound like an aberration, the reference to the incestuous relationship between the antagonist and his mother leaves one sick. The highlight of the trilogy is the exchanges between the opposing lead characters. Their desire to succeed and taunt each other in their face portrays the fallibility in them. They make their foe complete. On some level, they remind me of classic pairings such as Holmes and Moriarty, or Batman and Joker. And they are more relatable. "Hodges has read there are wells in Iceland so deep you can drop a stone down them and never hear the splash. He thinks some human souls are like that. " Finders Keepers, the second book, barely connects to the events in the first book. Although it is possible to read the second book before the first, it is not recommended. The author paints the third book of the series, End of Watch, in Black Mirror-esque hues when he incorporates concepts of transmigration, telekinesis, hypnotizing video games and remote terrorism into the confusing mix. As a result, the concluding book feels more like a Sci-Fi fantasy than a detective novel. The overkill of Sci-Fi is nauseating, even for an ardent fan of the genre. Some themes of the books may resemble his previous works, partly because of him being so prolific. I cannot see why the works are marketed as detective fiction. Good detective fiction is always a product of the premise, rather than the depth of characters. One other characteristic of the genre is the pursuit of protagonist seeking 'the truth'. Here the audience knows the perpetrator of mischief before the protagonist does. Also, I cannot recollect a single instance when the detective ‘thrilled’ me with his acumen. The only thing he and his team do is to go around questioning the suspects and witnesses. He has only his lucky charm to thank to as he stumbles on to the correct trail of investigation whenever he goes astray. With that said, the trilogy is in no way below par. Stephen King fans will find the books engaging, and I can vouch for this fact. And this will be a refreshing experience for the readers unfamiliar with his works.